In my introduction to “My big fat basement project” I mentioned the first part of the project, which was painting the basement floor. This was done mainly because a) the existing floor was in perfectly fine shape, it was just… well… ugly and b) I really couldn’t afford to do anything else to resolve the issue outlined in “a”. I was quite hesitant about doing this because the space is nearly 400 square feet and if I messed it up badly, or if the paint wouldn’t adhere, I would be forced to replace it, and that simply wasn’t financially feasible. I went online and did LOTS of research – DIY sites, individual homeowner blogs – read lots of advice about “how to” and looked at LOTS of before and after photos. Saw an equal amount of “you CAN’T do that” and “I’ve done this and it worked out great”. It was pretty confusing, to tell you the truth. Ultimately, though, I decided it could be done, and done well, and I could do it myself. I chose Zinsser B.I.N. Shellac-based Primer (appropriately tinted), and Valspar Ultra Premium Latex Satin Porch Paint in the color “Safari Brown”, as I wanted a deep chocolatey-gray brown (it’s VERY dark). I also decided that it was a good time to invest in a paint sprayer. Not only would this save time (and my back! ), but it would help ensure a beautiful, flawless finish, and I have lots of painting projects (including the wood portion of the front of my house), so I knew that a mid-priced sprayer would be a good investment. I decided to go with the Graco Spraystation (I KNOW, if you’re a mom like me, it sounds like “Graco Playstation” lol). It did a fantastic job and there was NO paint under my nails when I was done – LOOOOVE that! **Side note: Getting the gallon of Zinsser primer tinted was a bit of a challenge. “Outside” primer manufacturers (ie: Zinsser, et al) don’t leave enough room in their cans to add a lot of tint (as opposed to the store brand primers, who do since they want you to use/tint their primer with their paint). In my case, because I was going from white to a color that was nearly black, it was important that the primer was tinted per Valspar’s recommendation. Not doing this would have added at least one additional coat of paint. At Lowe’s (where I bought the paint) they are not allowed to pour out any paint from the can to create the necessary space to add the tint (I begged but they wouldn’t budge. Some nonsense about regulations or getting fired… blah blah blah *eye roll*…). Finally I asked if they would just give me the additional tint necessary in a cup and I could add it myself at home, to which they obliged. So, I ended up adding a small lidded container (they gave me the tint in a foam cup – I didn’t want to spill that in the Cadi! ), a large paint bucket and a paint mixer attachment for my drill to the shopping list (they did not charge me for the additional tint). When I got home, I dumped the gallon of primer along with the tint into that big paint bucket and used my shiny new mixing attachment to create primer perfection! When it came time to paint on the Valspar Latex Porch Paint, I found that I did need to thin it for use in the sprayer. For this I used Wagner Paint Easy Latex Paint Conditioner (recommended by the *paint guy* at Lowe’s). You can thin paint by the gallon, so that’s what I did so it would make filling up the sprayer container faster while I was working. One coat of primer and two coats of porch paint later, and my entire basement looked like a big, delicious, magnificent Hershey’s candy bar! I was so happy I poured myself a drink and did a dance! I was originally concerned that the pattern in the floor would bother me, but it doesn’t. 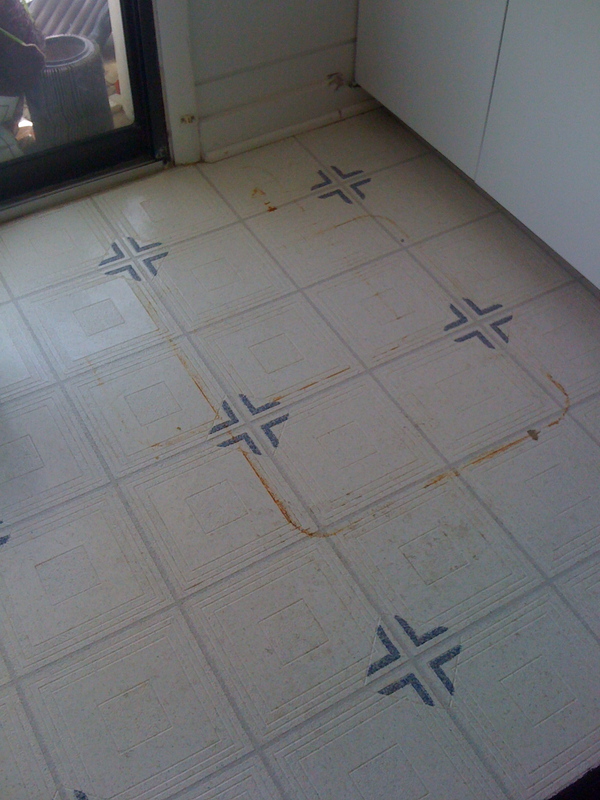 In fact, I think it adds wonderful interest to what would otherwise be a really plain slab-o-brown-floor! I let it cure for a week before moving furniture down there. It was kind of like torture, but I’m glad I put on my “patient” crown because I just know I would have managed to scratch that floor. Incidentally one week after moving the furniture down there the sump pump failed during heavy rain. We don’t talk about that day (shivers), I’m just grateful I discovered it when I did because otherwise it could have been a lot worse – it turned out to be a failed electrical socket and my pump has no backup (Hey, I’m from L.A. we don’t have basements – or rain lol – so there is a wet weather/basement learning curve going on, mkay?). Since I had to use chemicals down there to clean in order to get the *stinkies* out, I did end up messing up bits of the floor that just weren’t ready for chemicals yet. 😦 A little touch up here and there and everything was good as gold again, though. All’s well that ends well…. Having the primer tinted that dark really helped speed up the process, and meant fewer coats of Latex paint. That's ONE coat of primer! 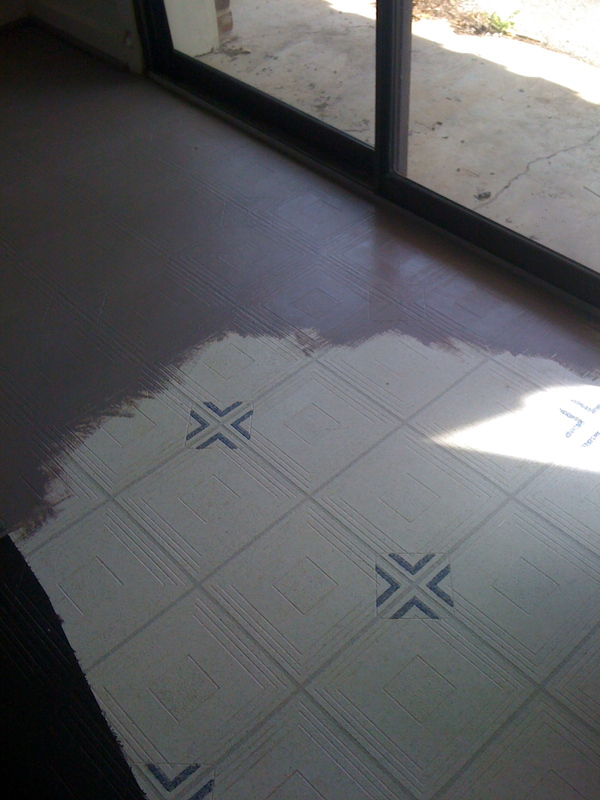 The contrast between the floor *before* and the painted floor *after*. I used one coat of primer and 2 coats of paint. The finished floor (or a slice that doesn't have a rug or furniture on it!). Now, doesn't it make you want to run and get a chocolate candy bar? 1) Take your time when *taping off* (top, bottom, seams in between sheets of plastic/canvas/whatever you’re using). When you spray, the fine mist will get in to places paint wouldn’t if you were brushing it on. You don’t want to remove the plastic and discover you painted half the wall by accident (boo!). 2) Make sure if you’re going much darker that you tint your primer per manufacturers instructions. It’ll cut down your painting time, and save money on paint. 3) Make sure your primer is tinted properly! They didn’t actually tell me they couldn’t tint it, I figured out when I looked at the paint “blot” they put on the lid, which didn’t look tinted at all – it was barely off-white. Since it didn’t look right, I asked questions and found out about the lack of space in the can, etc., that I mentioned in the *side note*. When I tinted it at home using the rest of the tint, it was waaaaay darker than what they tried to send me out the door with. If something doesn’t seem right, don’t be afraid to ask questions! 4) If you’re going to do large sections of floor, invest in a sprayer. You’ll thank me later (after you’ve forgotten all about the overtime you had to work to pay for it lol). 5) Shellac based anything requires lots of ventilation! Remember to work safe. 6) If you think it can be done, it probably can. Often products made for one application can be easily adapted for use in another (blush as eye shadow, anyone?). Do your research and find a way! 7) Most importantly ~ Don’t be afraid! Kick off your stilettos, grab an old t-shirt and get to work… YOU CAN DO IT! Many of you have one. Some of you have tackled yours. Some of you lock the door and refuse to “go down there“. Some are dark and damp and smelly. Yeah, I’m talking ’bout basements. I have one. And I’ve been battling it (off and on) since last November. Now I’m good at the follow through if it’s something I can finish in one fell swoop, as it were. But things that require doing, waiting, then doing some more, you’ll often lose me during the “waiting” period – especially if there is more than one “waiting” period (do… wait… do… wait some more… do some more… wait – ooooh look at the pretty butterfliiiiies…..). So that brings me back to my *big fat basement project*. I’m blogging about it, honestly, in an attempt to actually try to stay on track with it. I’ve now been working on it for 4 months and it’s nowhere neeear finished. Hopefully by putting it all out here and posting about it regularly, bit by bit, it will keep me focused on actually completing the project, which is to be my new office space. Not having it finished is keeping me from moving forward with other business projects, so, dragging my feet on this has really affected me beyond just the issue of *aesthetics* (which, trust me, is HUGE). What have I actually managed to get done? So far I’ve painted 7/8 of the floor. And floor painting was the first and most essential part of the project. 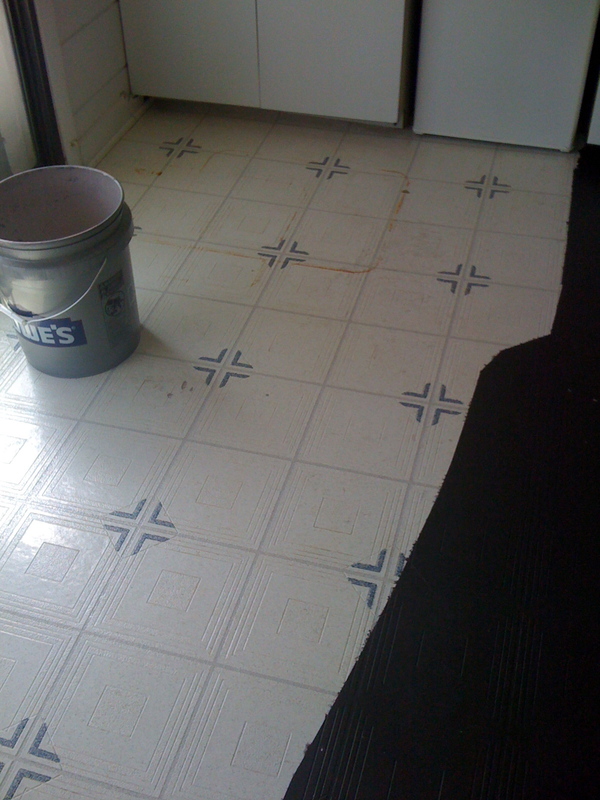 My basement had horrible blue and white vinyl flooring. It was in good condition – no splits or lifting – but it was uuuuuugly! 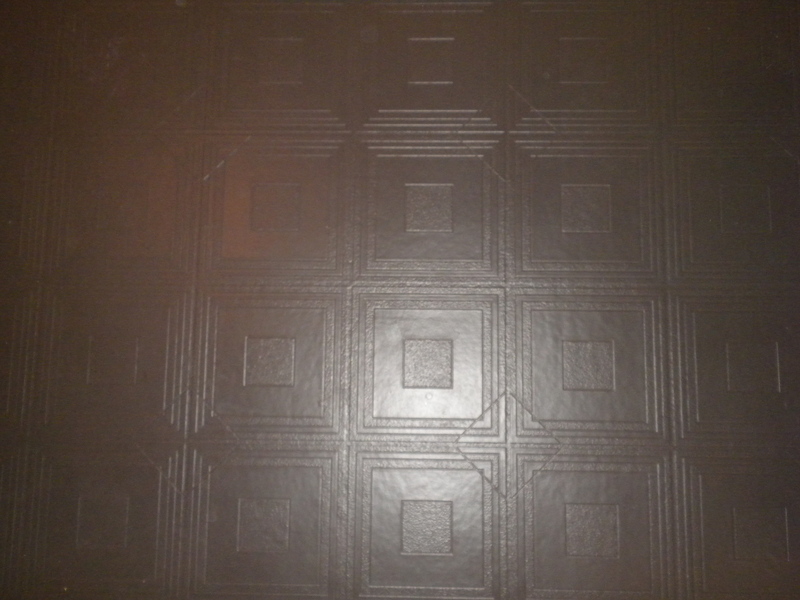 New flooring wasn’t really in my budget – frankly re-doing the basement wasn’t in my budget lol – so I got resourceful and figured out how to paint it…. Here’s a photo of the basement “before”. Note that this picture was from the previous home owners (I would NEVER put anything in my home with UT on it haha!). Once I moved in it was just full of junk. Unfortunately it’s the only photo I have and I had to pull it from a really bad PDF, but you can still see all of its ugly shining through lol…. I will tell you all about my adventures in floor painting in my next post (this one’s already too long). And I will tell you all about counter painting… and cabinet refinishing… and free rugs (yep, I said FREE)… and carpet removal (yucky stair carpet!) and all of my other fun (and cheap!) DIY and decorating adventures in future posts. Ooh, and tips and tricks are welcome and greatly ENCOURAGED (I’ll take all the help I can get)! I’m looking forward to having you along on my journey to complete my *big fat basement project*!